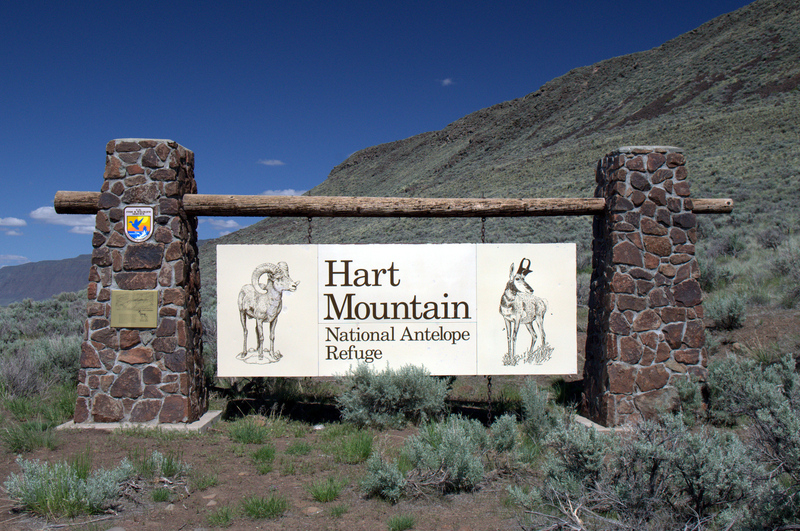 Hart Mountain National Antelope Refuge (NAR) is a 280,311 acre (438 square mile) piece of high desert located 65 miles east of Lakeview, Oregon. 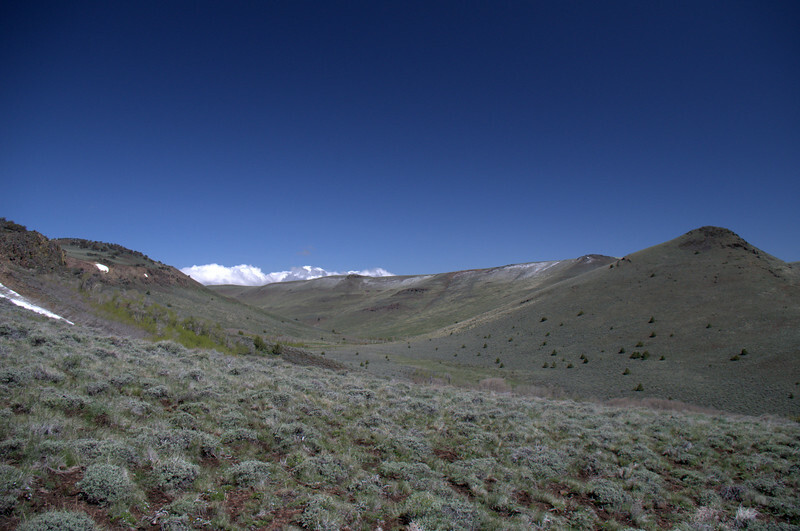 Its western side is a massive fault block ridge that ascends abruptly nearly three-quarters of a mile above the Warner Valley floor in a series of rugged cliffs, steep slopes, and knife-like ridges. 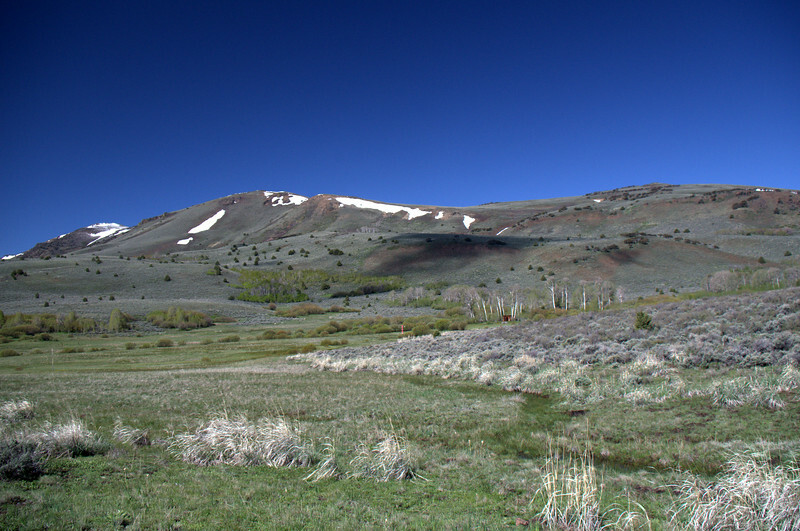 Since its creation in 1936 as a range for remnant herds of pronghorn antelope, management of the refuge has broadened to include conservation of all wildlife species characteristic of this high desert habitat and restoration of native ecosystems (details). 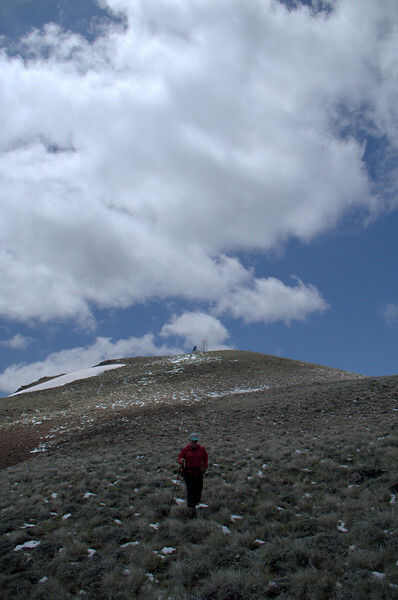 Warner Peak (8,017 feet) is the highest point in the Refuge and one of Oregon’s top 100 peaks (#87) and is also sought after as an Oregon Prominence Peak. 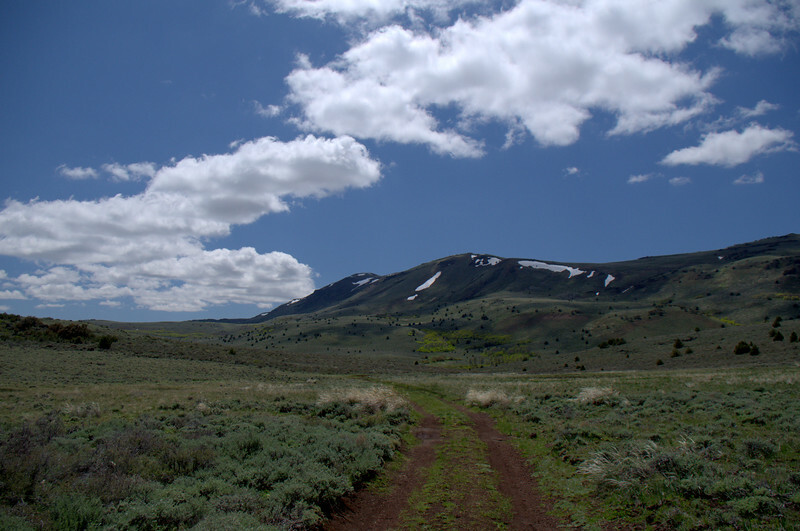 Reaching its summit is an easy, partially on-trail, partially cross-country dayhike that combines peakbagging with the opportunity to see some of the plants and animals that live in the Refuge’s backcountry. It truly is in the middle of nowhere as reaching it involves a 5-7 hour drive from most of Oregon’s population centers and the closest town of any substance is 65 miles away. Still, it was someplace we’d always wanted to visit and, with a high pressure ridge in place for a couple of days, we decided to go for it. We drove over to Lakeview the night before and, after an early start the next morning, made it to the upper trailhead by 8:30am. This is where a locked gate creates seasonal access to the Barnhardy (or Barnhardi) Road. There’s limited parking here, so, during the busy season(? 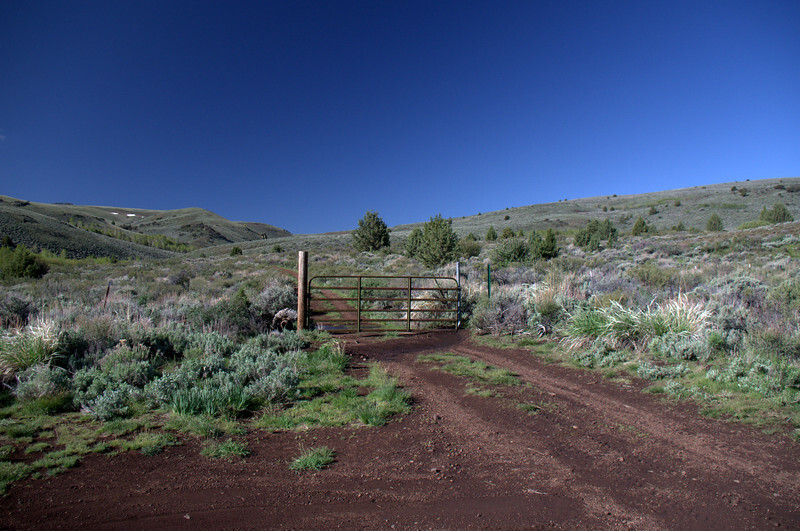 ), most guides suggest parking at the Hot Springs Campground and walking 0.5 miles of old road to this gate. While the weather up here can sometimes be fierce, cold, or real exciting (desert thunderstorms! 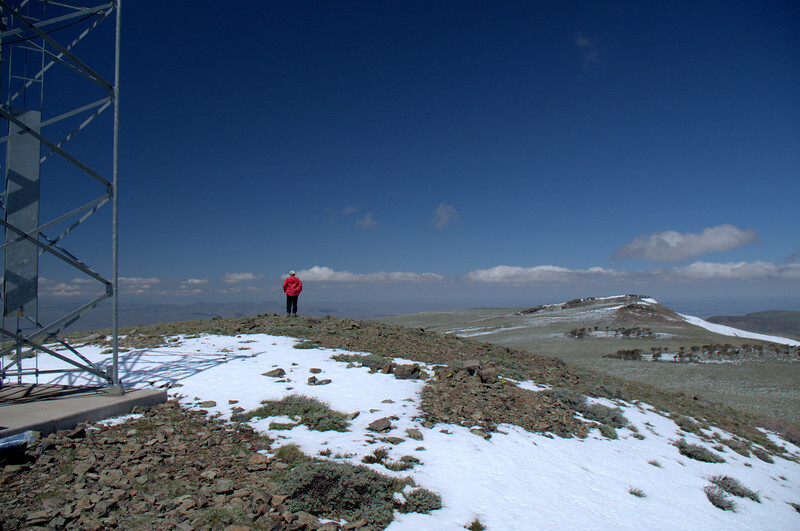 ), we were greeted with blue skys, a light wind, and 65 degree (F) air temperatures – whereas it had been raining and snowing just the day before. 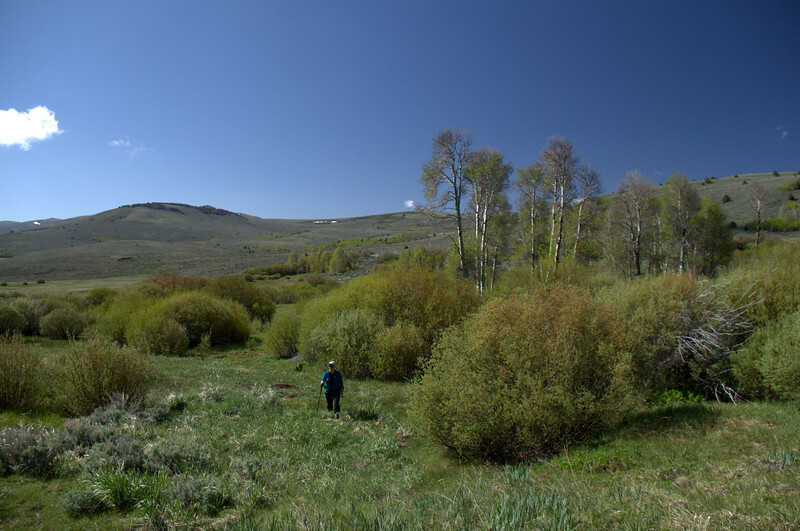 While this is high desert, the area is graced with a number of springs and creeks that are a critical water resource for native wildlife. They also create bogs and wet areas that are home to lots of mosquitos – lots of mosquitos! But on this occassion, there were no flying, biting insects of any kind – will miracles never cease? 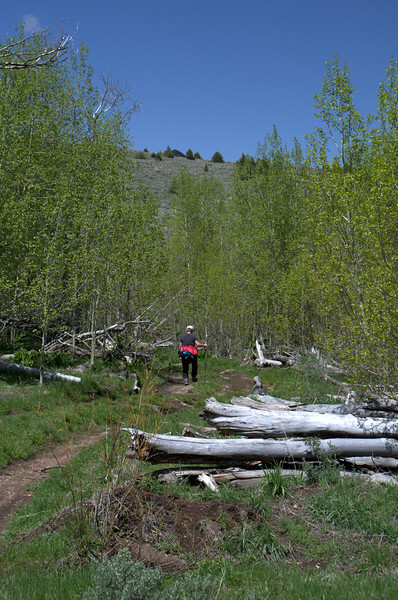 We went through the gate, stepped across Rock Creek, and headed south on the Barnhardy Road, through groves of aspens lining sections of the road. 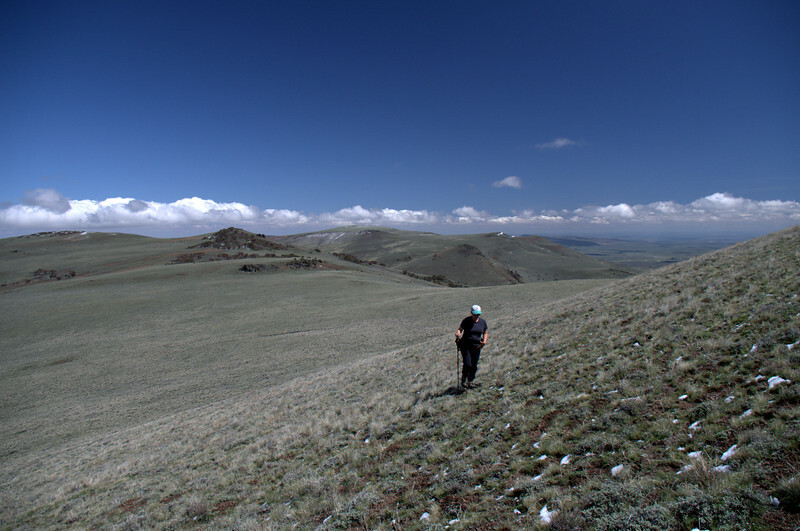 Pretty soon, we broke out of the trees for the first of the hugely expansive views we’d enjoy for the rest of the day. This made us reflect on how many hikes we do that are mostly in the trees and how rare it is to do a hike where you have big, wide views all the time. 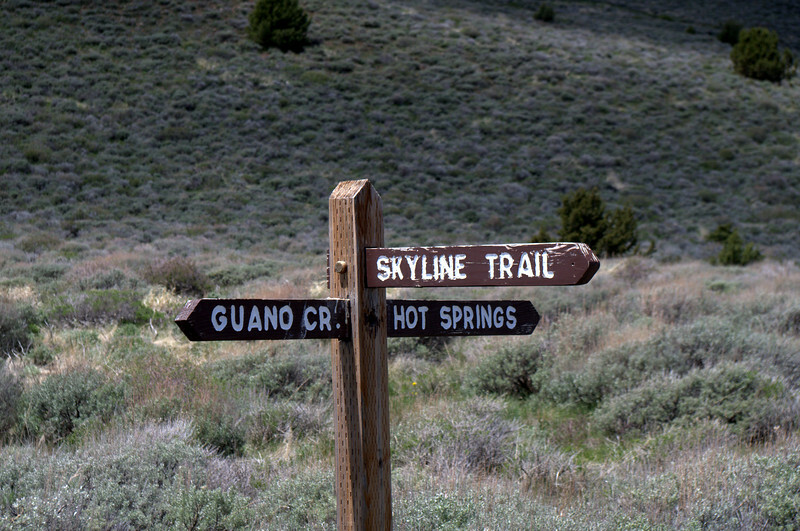 About 1.3 miles from the gate, we came to an obvious junction with a jeep trail running up the ridge to the west. 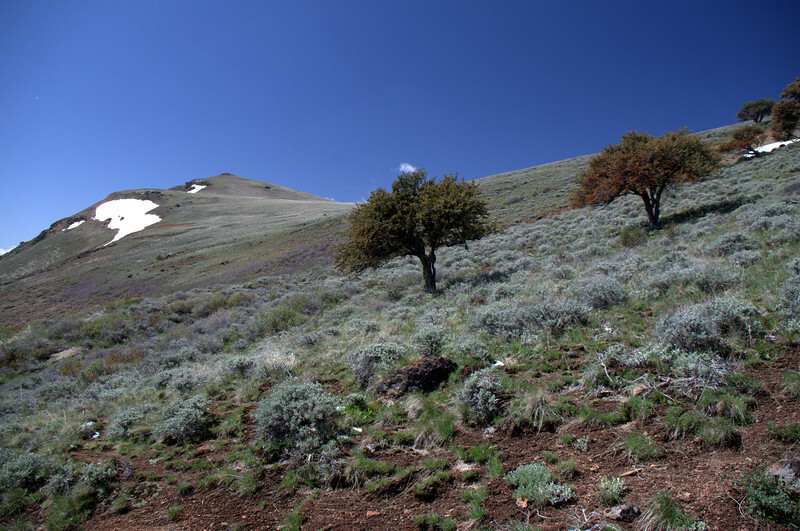 This is an alternative route to the summit, as described in Sullivan’s 100 Hikes / Travel Guide: Eastern Oregon (2nd edition), Hike #90. 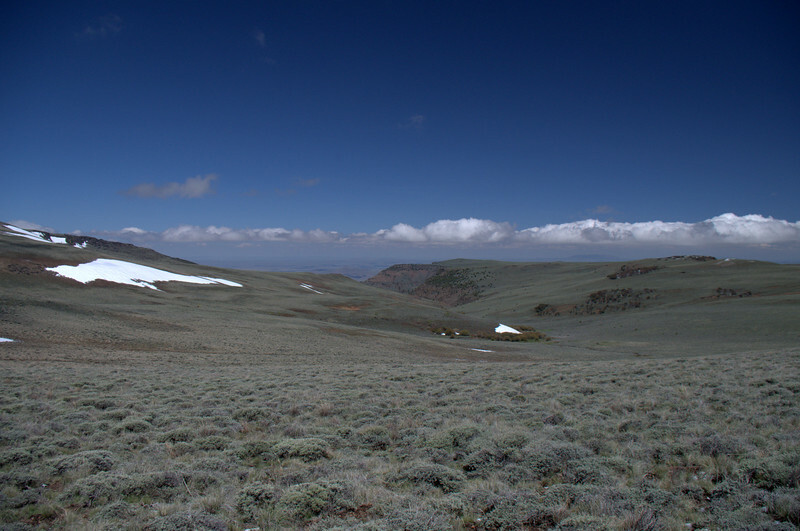 From this point, we had a clear view of Warner to the south – and could just make out the communications facility on its summit. We took the left fork here (the Barnhardy Road) and descended gently into Barnhardy Basin – seriously irritating a crane along the way – to where there’s an old line cabin and a SNOLITE site (the red post). Time for a geek interlude here. 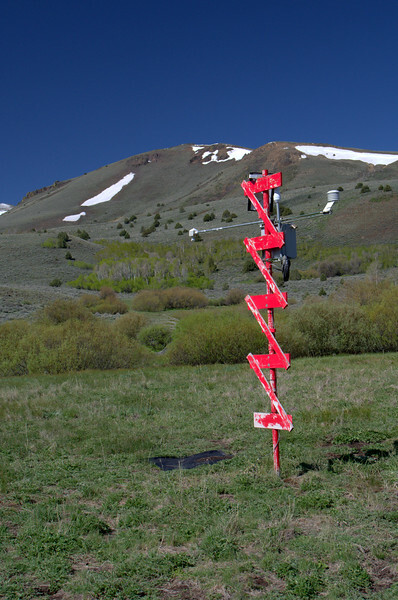 When we were researching this hike, we found some folks asking “What is that red pole?” Well, it’s an automated aerial marker site that sends information on snow water equivalent (SWE), air temperature (max, min, current, average), and snow depth to the National Resource Conservation Service to help with water forecasting (details). 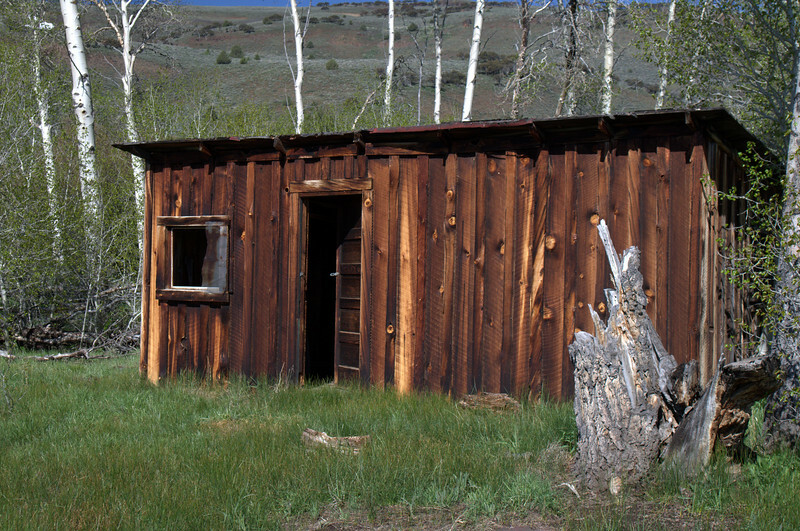 This old cabin is situated in an idyllic location (well, maybe not in mid-winter) that during our visit harbored a profusion of bird life, including foraging raptors and some Western tanagers. We also spooked a coyote. 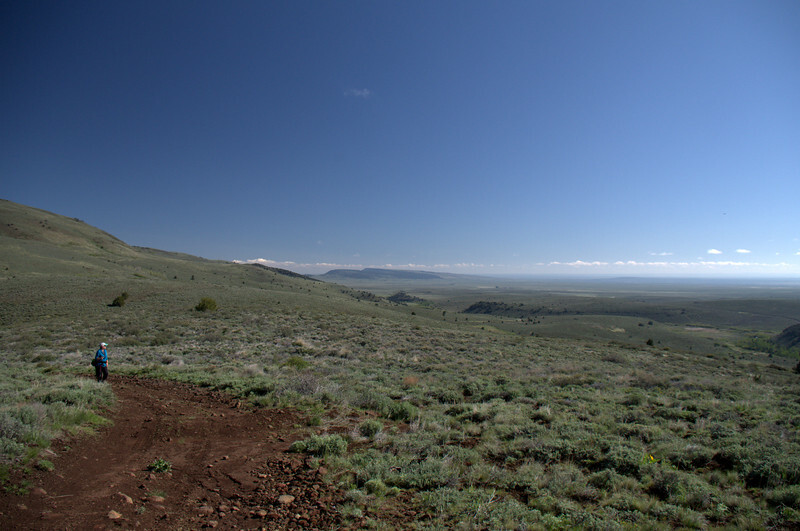 From the old cabin, we turned west and started up the canyon toward DeGarmo Notch, an open spot on the ridge above. 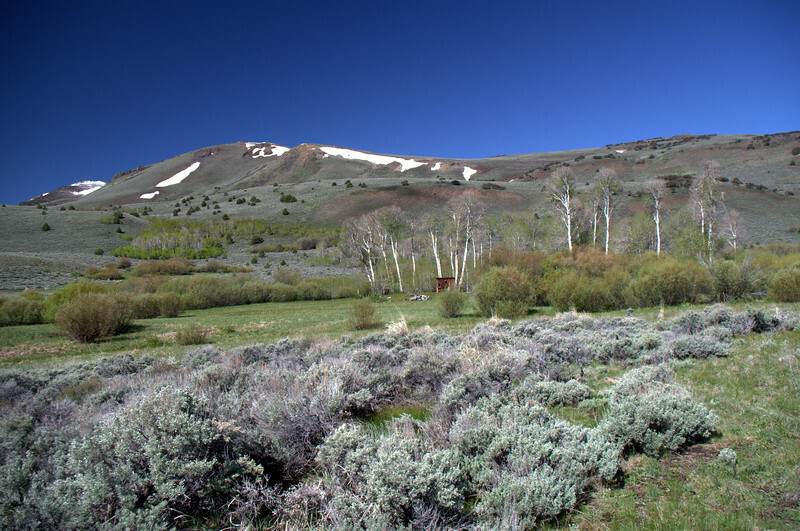 It should be noted that the profuse vegetation around the cabin and in the basin represents grow-back after the cessation of grazing back in the 1990s. It’s also quite boggy here but, again, we didn’t encounter any flying, biting insects – the miracles continued. 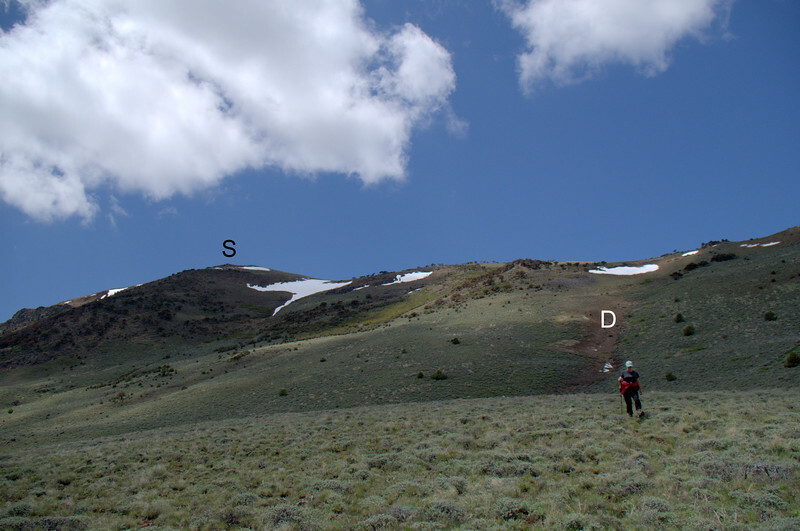 Sullivan (and other guides) have you climbing up the gully to the Notch and then turning south toward the summit. 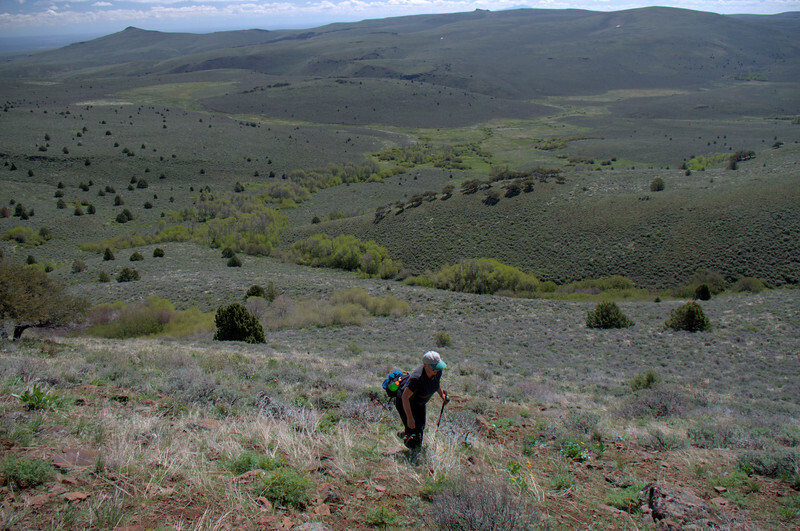 But we found this terrain to be pretty easy to move through cross-country so, rather than go to the Notch, we just contoured up the slope above and south of the cabin. The slope wasn’t sleep – most in this area aren’t – but, what with the 7,000 foot altitude, there was some deep breathing going on here. There were a lot of flowers out but most of them were tiny and growing in clumps about one inch from the ground. 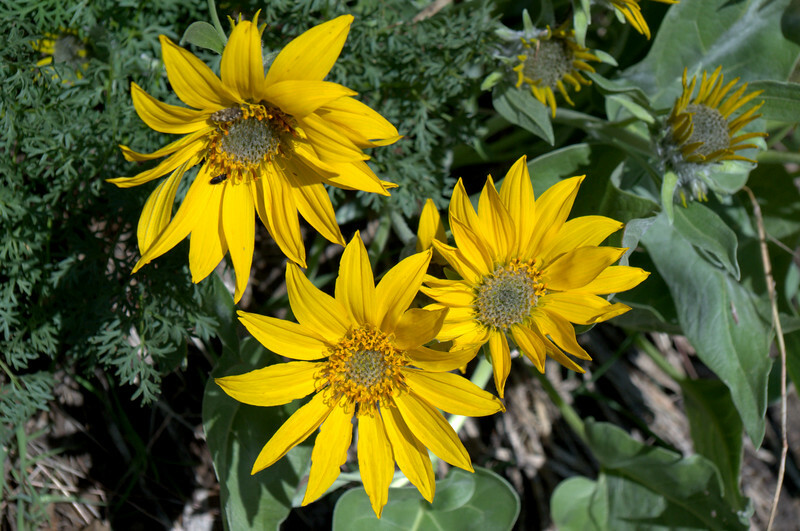 Only the ever reliable balsamroot was gaudily promient as we ground up the slope. 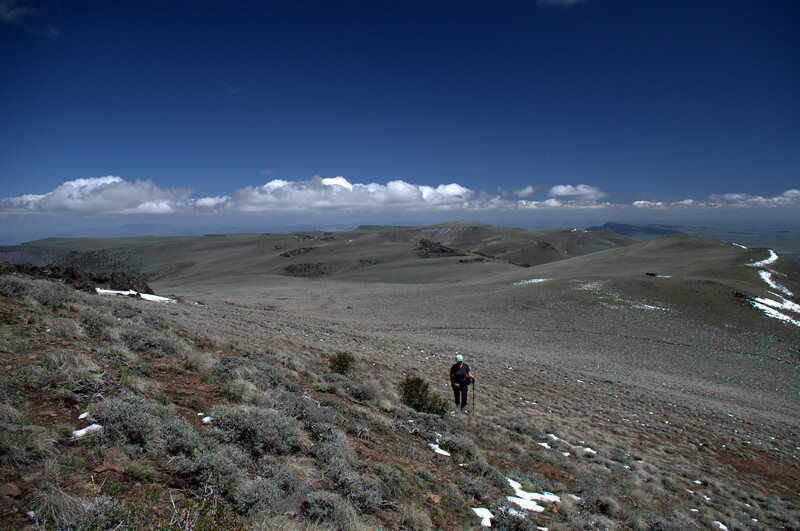 As we approched the big saddle at 7,400 feet, the slope lessened, and the sagebrush got more stunted, so the walking got easier. From near the saddle, we had a nice view down the North Fork of DeGarmo Canyon, which is part of the alternate route to the summit that starts back at that old jeep trail. 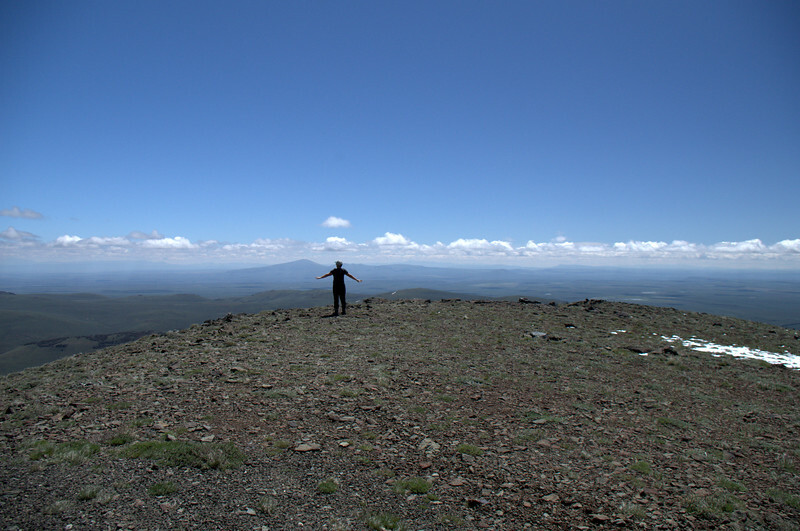 We got to the big saddle about 1.3 mi from the summit and from there it was easy walking toward the summit. The view along the way was, of course, awe inspiring – as was the incredibly pleasant weather! 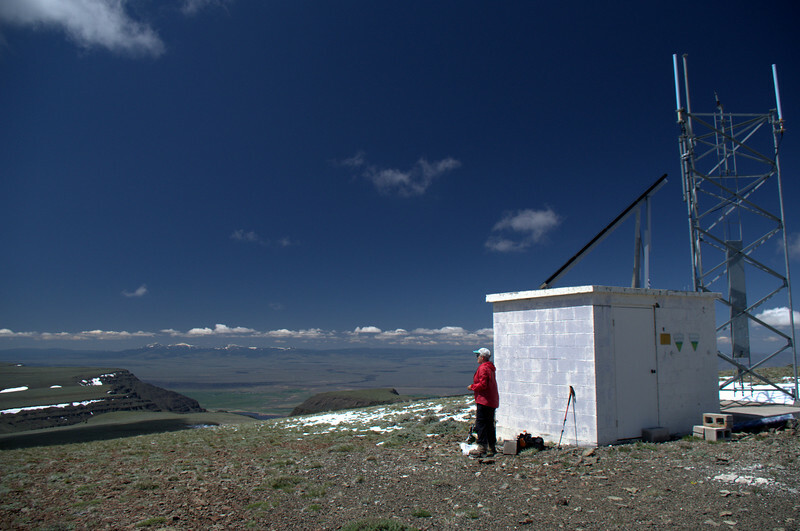 We could also see the summit from here – along with the building and antennas that grace it – something to aim for at least. Along the way, we got a view down the South Fork of DeGarmo Canyon. and then we were there! A little Sound of Music action broke out as we were totally swept away by the 360 degree view for at least 100 miles in every direction. “The hills are alive…,” etc. The communications facility looks like a glorified pit toilet but it did provide seating and a handy windbreak for a snack. Twelevemile, McDowell, and Crook are the snowy peaks in the distance. This wasn’t a particularly steep descent and the gully is mostly brush-free dirt until it levels out just before reaching the road. 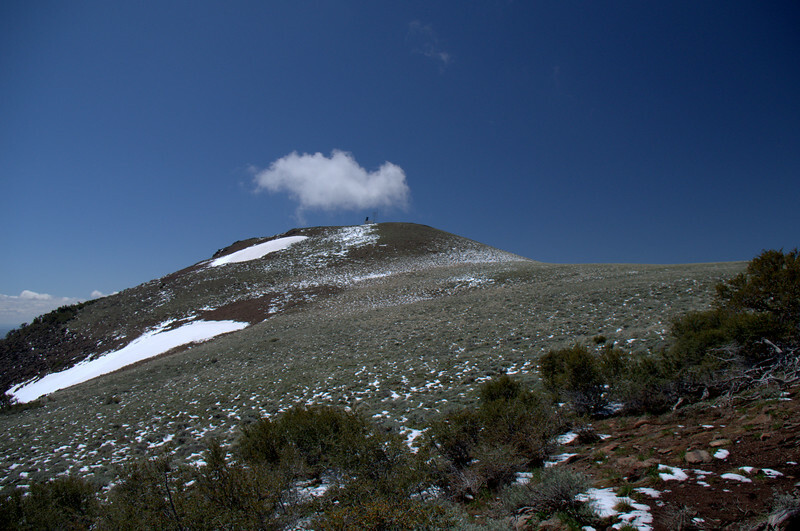 While this would probably be the quickest – and steepest – way to ascend this peak, going up this way would rob you of a nice hike along the ridge, with its views of the DeGarmo canyons. 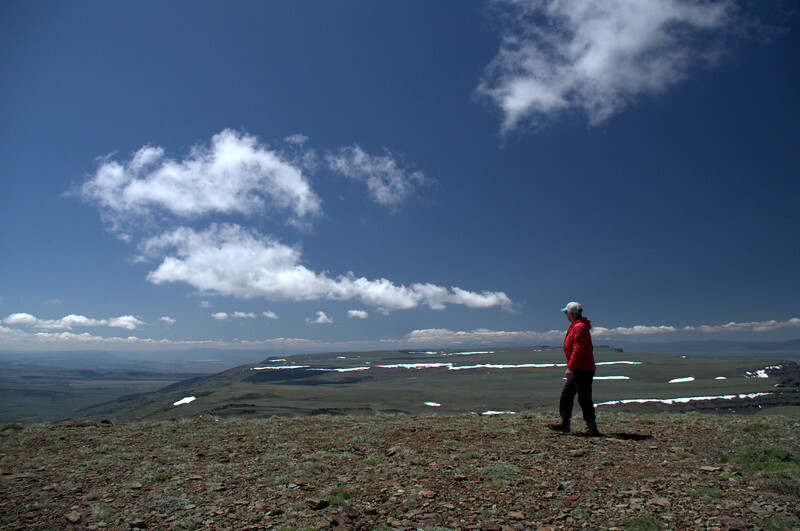 We were aiming for the stout wooden gate that is the key directional feature for the ascent – walk up the Barhardy Road to this gate, turn right (west), and go up the slope, turning left toward the summit before reaching the top of the ridge. There’s also a signpost near the gate. 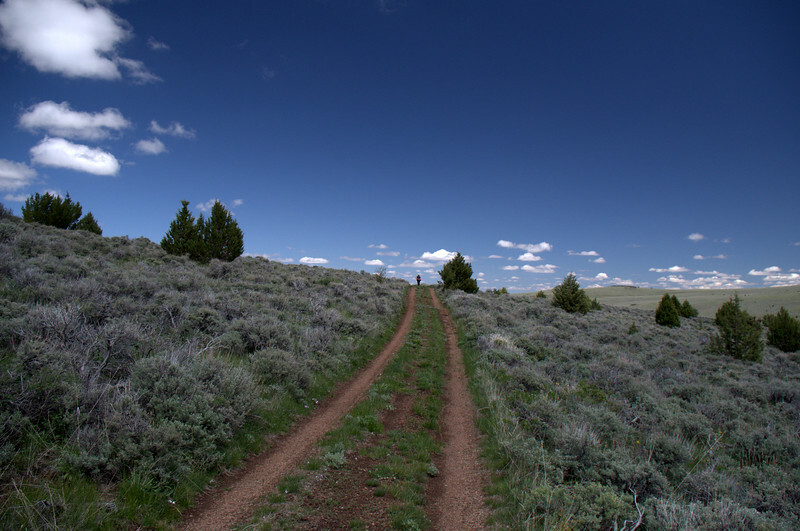 We then followed the Barnhardy Road north back toward the trailhead. 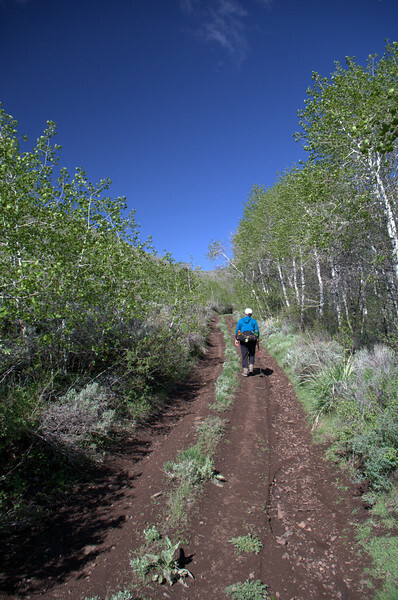 While it’s a road, it’s not bad as a trail, and takes you down and through some aspen groves that are supposed to be spectacular when they take on their Fall colors. 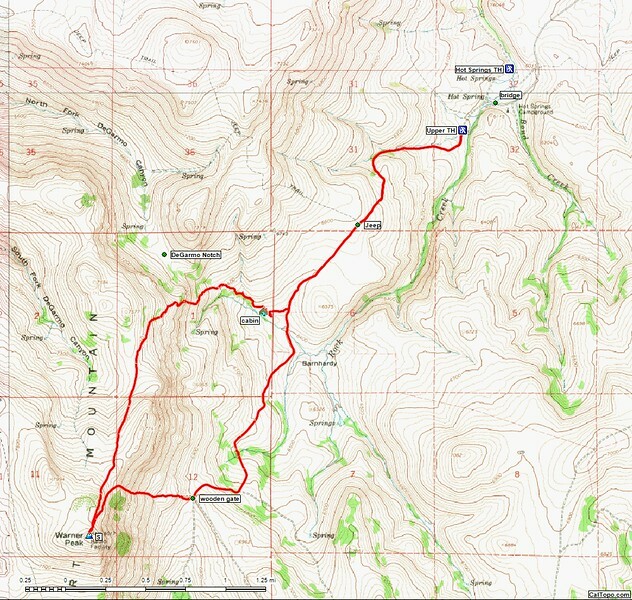 In some of these wetter areas, the the road deteriorated to 4×4 quality but remained fine as a trail. 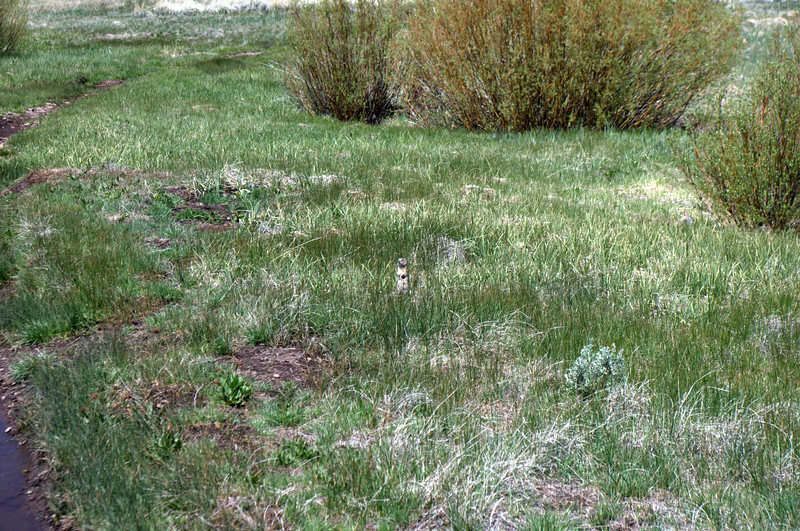 under the watchful eye of a seemingly inexhaustable supply of ground squirrels! One last look back at Warner Peak as we approached the trailhead. 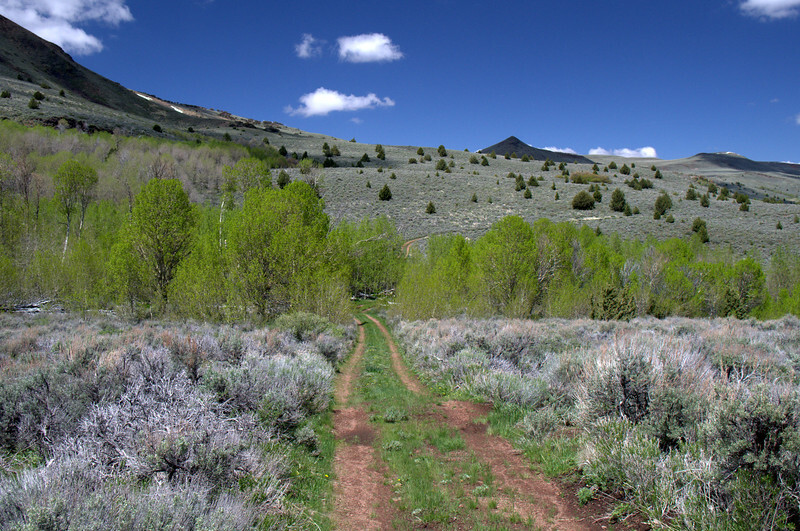 A moderate hike (9.2 miles round trip; 2,300 feet of elevation gain – if you start at the gate) in a stunning location, with views everywhere. 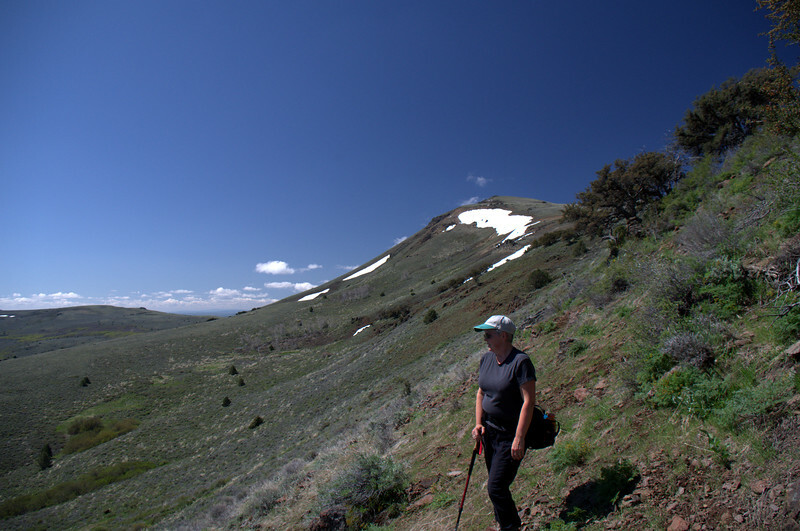 There were no irritating bugs (at least for us) but we did see antelope, mule deer, a coyote, a crane, western tanagers, a long-tailed weasel, and innumerable ground squirrels in varying sizes. 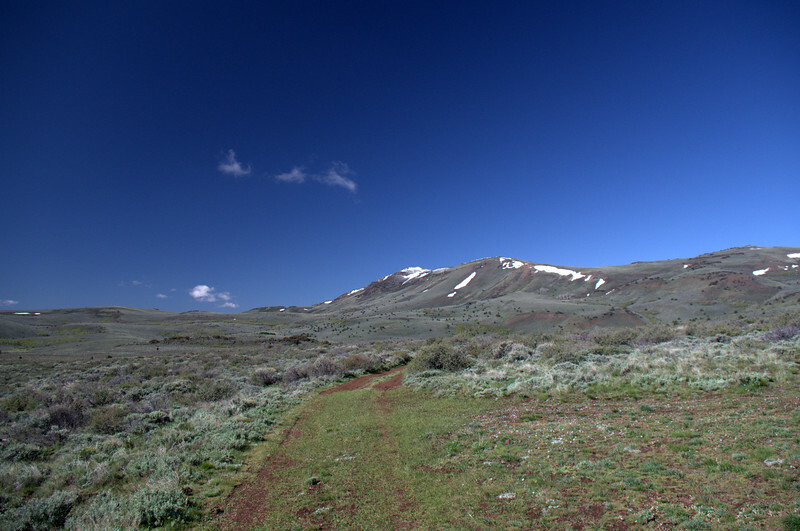 The terrain was not unlike that in the Steens some 50+ miles to the east but we could see these from the summit and their upper reaches are still covered in snow. So the snow-free Hart NAR was a win-win! We thought about spending another day but the weather forecast had the high pressure ridge breaking down rapidly and was forecasting snow down to 4,500 feet by Friday! So we decided to head home before doing so became an adventure in its own right! 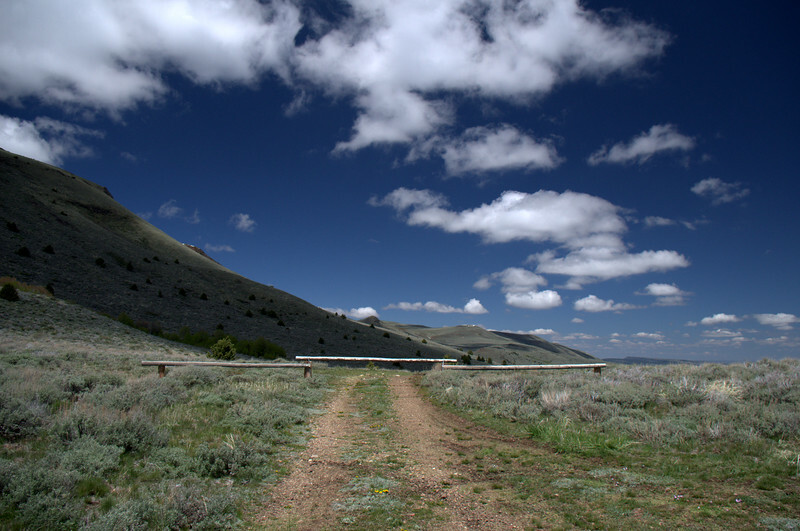 For more hiking options in the refuge look here.